I could feel tension drain from my shoulders as I looked at the crystal clear, aquamarine ocean. I was already imagining floating in that beautiful water, basking in the sun, and wiggling my toes in the white sand. 10 seconds ago, I was tired from a long flight, worn down by my endless to do list, and I just wanted to collapse in a pile. The Grand Fiesta Americana Coral Beach Cancun is perched on what’s likely the best location in Cancun. Beachfront, with stunning views and easy access to the water, it’s also in the heart of the Hotel Zone, with easy walking access to great restaurants, attractions, and more. Despite the close location to some of the most happening places in Cancun (including Coco Bongo’s, Senor Frog’s, the Hard Rock Cafe and Carlos’n Charlies), the resort is remarkably quiet and contained. There are 602 ocean view suites at the Grand Fiesta Americana Coral Beach, each with a private terrace, and all of them facing the turquoise water of the Caribbean. Here’s a little peek of the view from our fifth floor room. Heaven! The Grand Fiesta Americana Coral Beach Cancun has a few plans to choose from: all-inclusive, a hotel only plan, plus a Grand Club access plan. For this trip we wanted to sample some of the nearby restaurants so we opted for the hotel only plan. 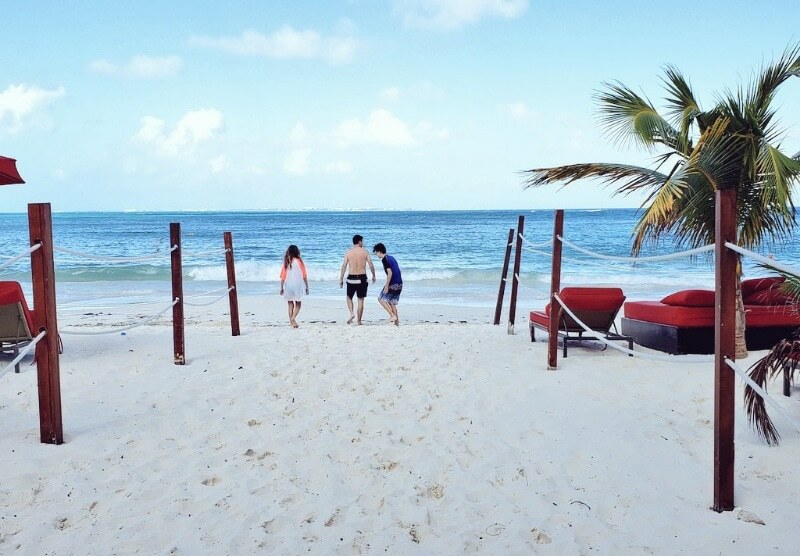 We think that the beach at Grand Fiesta Americana Coral Beach is one of the best in Cancun. 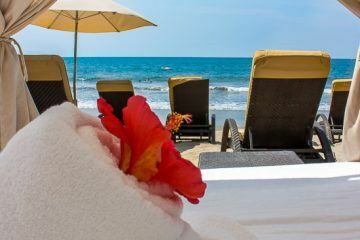 Due to the resort’s north facing position in the Hotel Zone, the beach is well protected. Especially compared to the majority of the east facing hotels that adorn the rest of the hotel zone. As a result, the waves are generally much smaller and, even when the red flags were out for the rest of the hotels, we could still swim in front of our hotel without problems. We also saw plenty of small children playing in the sand, which is rare on Cancun’s beaches that see bigger waves. There are tropical palapas along the sand, and we found there was plenty of chair lounge access on the beach. There’s also a large floating dock not too far off from shore and, for those without kids, there’s even an adults only beach section. Pier on the western end of the beach. We love hanging out poolside, and the ocean side pools at the resort were a huge part of the reason we decided to visit. We weren’t disappointed! There are three expansive swimming pools onsite at the Grand Fiesta American Coral Beach Cancun, all with gorgeous ocean views. We spent most of our time in the main pool, which has the benefit of the most sun exposure (we visited in December, so we wanted a lot of sun), and also houses the poolside snack bar. There’s also a few fountains and water massage jets in the main pool that the kids loved playing with as well as a giant waterfall leading down to the other two pools. The main swimming pool is also a multi-level pool, with different water depths. There’s a lovely shallow section that runs around most of the edge that’s perfect for kids or just to relax on, a deeper section that’s a bit quieter, and a pretty bubbly Jacuzzi opposite the snack bar. Like almost all Jacuzzis in Mexico, it isn’t heated, but the shallow water and bubbles are a lot of fun anyway. One thing I really loved about the pools here is that we had absolutely no trouble finding poolside loungers for the four of us at any time of the day. There are two other swimming pools onsite, both of which were a little quieter and cooler, and got a little more shade during the day than the main pool. I think these would be fantastic in slightly warmer months, where you’d want a break from the sun and heat. 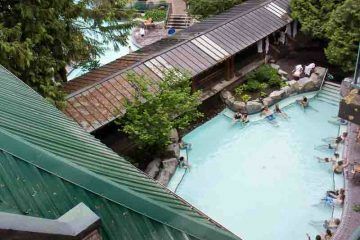 The other big pool also features another swim up bar but was quieter while we were there. 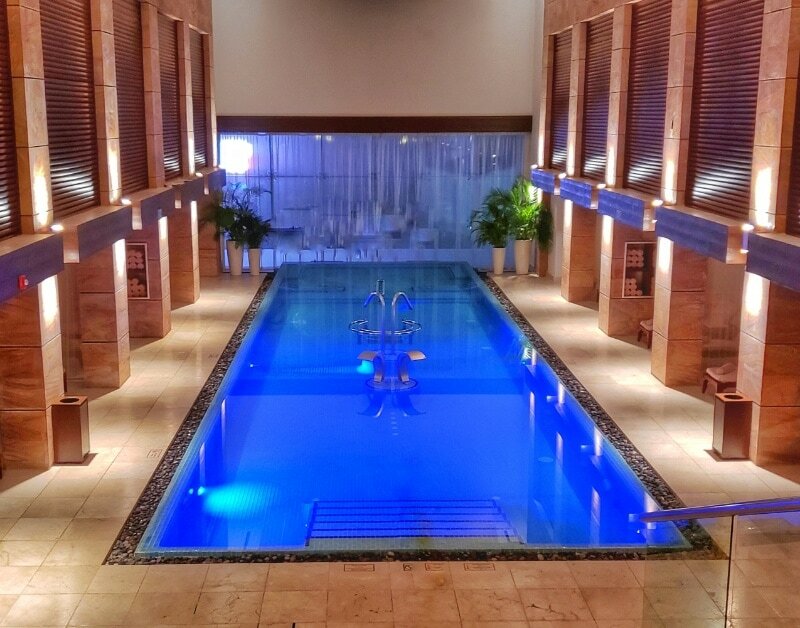 With a 40,000 square foot spa on site, complete with a custom 10 step hydrotherapy ritual, how could we resist sampling the waters? We left the kids happily playing video games in the room one evening while we headed downstairs to enjoy a couples massage. What a fantastic decision! Our 45 minute relaxation massages were fantastic and, truth be told, some of the best we’ve had. 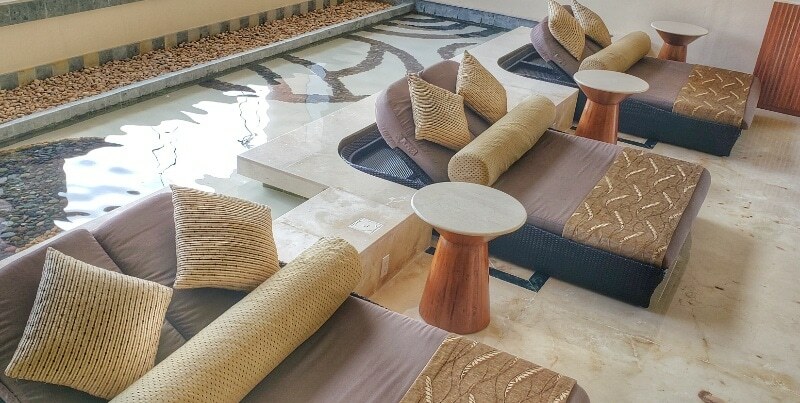 The entire spa at Grand Fiesta Americana Coral Beach in Cancun is beautifully designed and spacious. 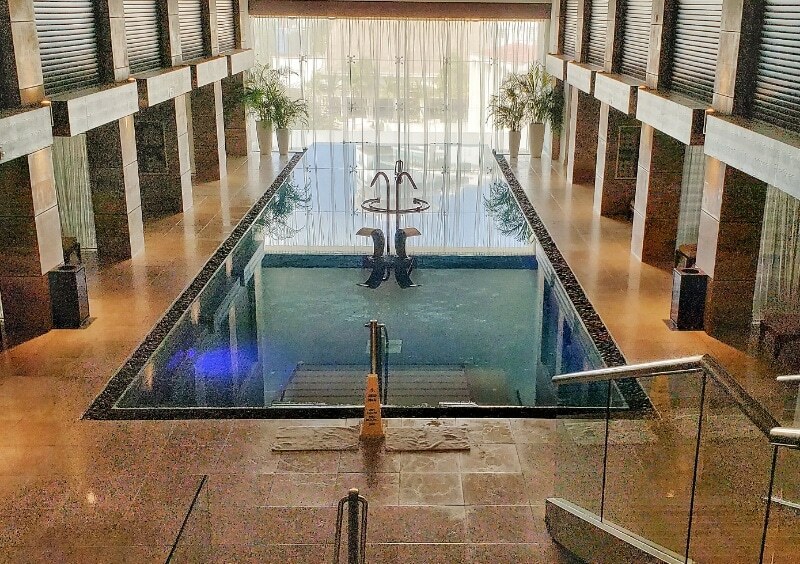 10-step hydrotherapy ritual. The hydrotherapy treatment takes you through ten treatments, ranging from hot, bubbling hot tubs, to steam rooms, to ice cold plunges. (Note: We didn’t take photos in the main hydrotherapy area to preserve the privacy of other guests). The unique hydrotherapy experience ends in the main pool, where there are waterfall plunges (you can see them in the center), and bubbling loungers. 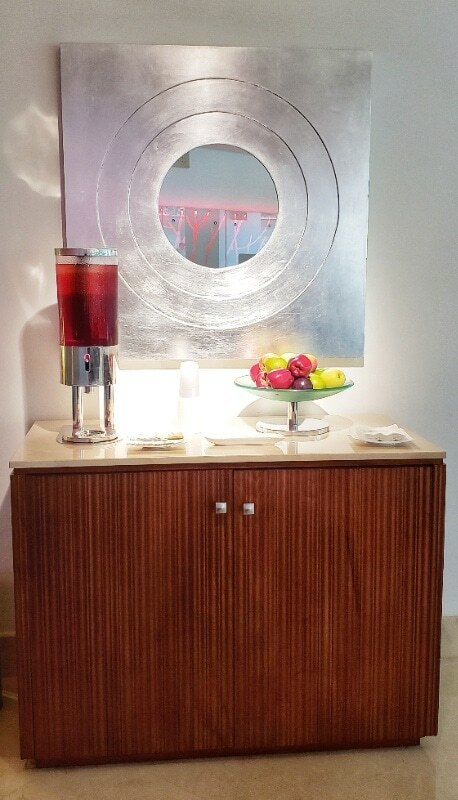 As you’d expect, there are light snacks, tea, and fruit infused water throughout the Gem Spa for the customers to enjoy. 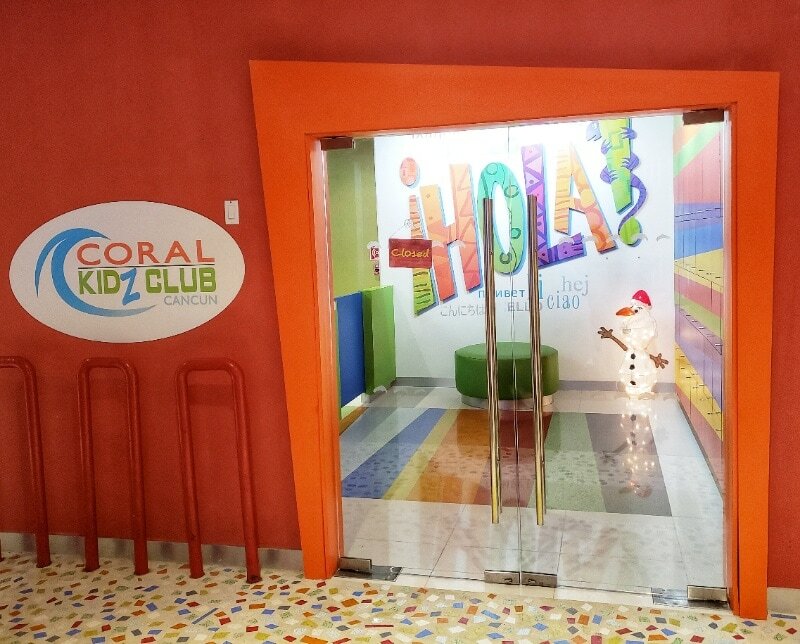 Like everything else here, the Coral KidZ Club is top notch. It’s open from 10:00 am to 6:00 pm, with lots of activities to amuse the kids, including beachfront sand castle building, sea shell hunts, crafts and other fun games. Our kids deemed they were “too big” for the kids club, but we took a tour (during their closed hours) to check it out. It’s bright, and looks like a lot of fun (so much so that the kids were a little sad they didn’t check it out for themselves). 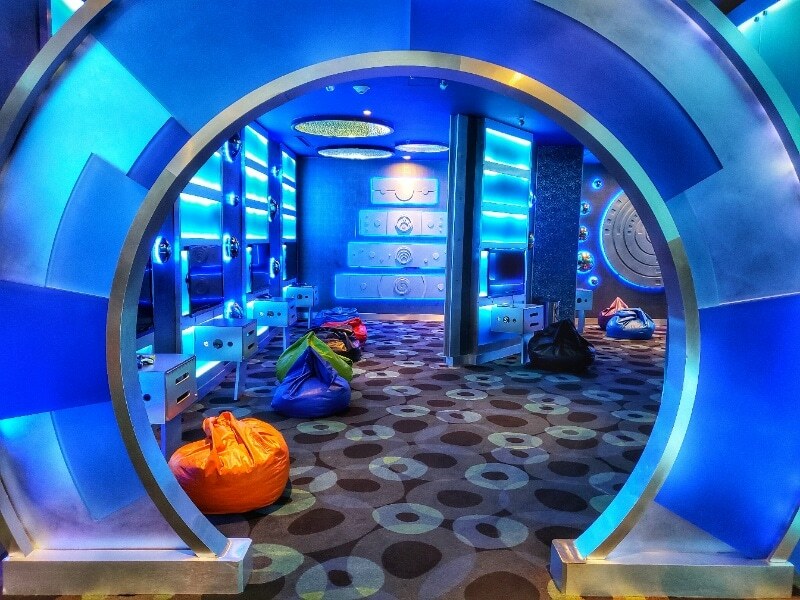 Just check out all the gaming stations (great for keeping kids occupied on rainy days) as you walk into the Kids Club. 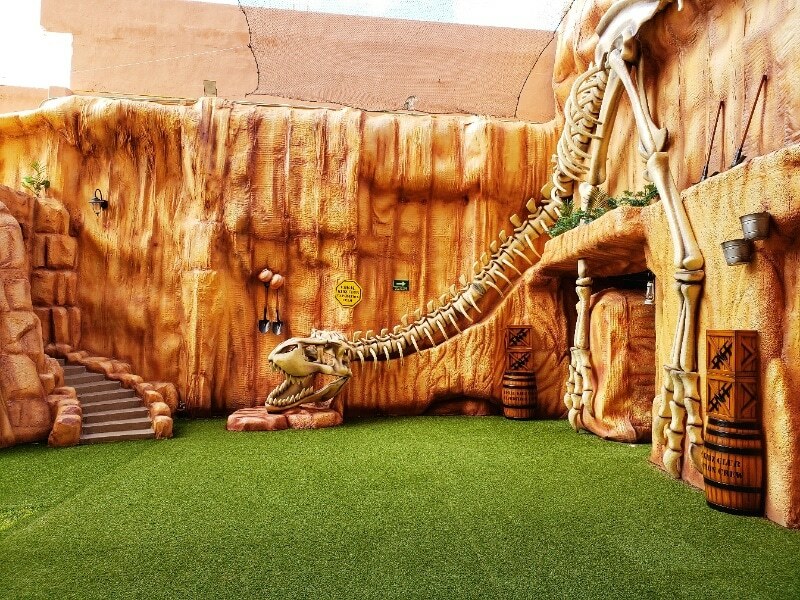 There’s also an outdoor play area (check out that awesome dinosaur theme), plus an indoor stage. 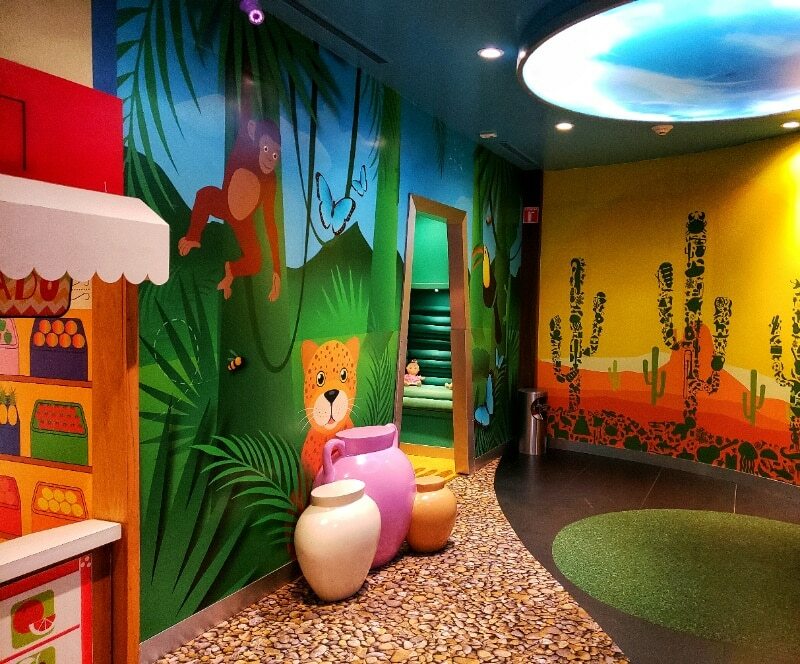 There’s also a fun play area inside for the little ones. Our room was on the fifth floor, making for an amazing view over the ocean. The two queen beds were fantastic for the four of us (mom, dad, and two kids), with a large sectional couch for relaxing and enjoying that view, and a little sitting area. One of the nice perks was the mini bar, which was loaded with pop, juice, and beer, and a nice selection of snacks, as well as some mini bottles of hard alcohol. Since we had a room only plan, no snacks or meals were included. The mini bar prices were about in line with what you’d expect for a nice resort in Mexico, for example, pop was a couple of dollars a can. Since the hotel’s in the middle of Cancun’s Hotel Zone, there are plenty of Oxxo convenience stores a five or ten minute walk away. 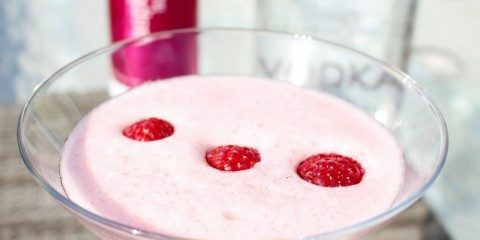 Just grab some snacks and drinks from there to save on mini bar charges. There were a lot of lovely touches in the room, including fresh cut flowers in the bathroom. Housecleaning was fantastic. The room was spotless when we arrived, and they kept it that way. They respected our do not disturb signs, and came in and whisked away our mess when we were downstairs enjoying the pools and beach in the afternoon. One small downside was that our air conditioning was a bit loud. When the a/c fan blew through the ducts, there was a bit of rattling above the bathroom ducts. We solved that pretty easily by closing the bathroom door though. There’s even a snack bar, which is enough motivation to get me to the gym. Since our rate included our room only, we mostly ate out at restaurants in the Hotel Zone. There’s a huge selection of nearby restaurants that’s all easily walkable! Since one of our very favorite things at a resort is room service, we decided to check it out on our first night there. 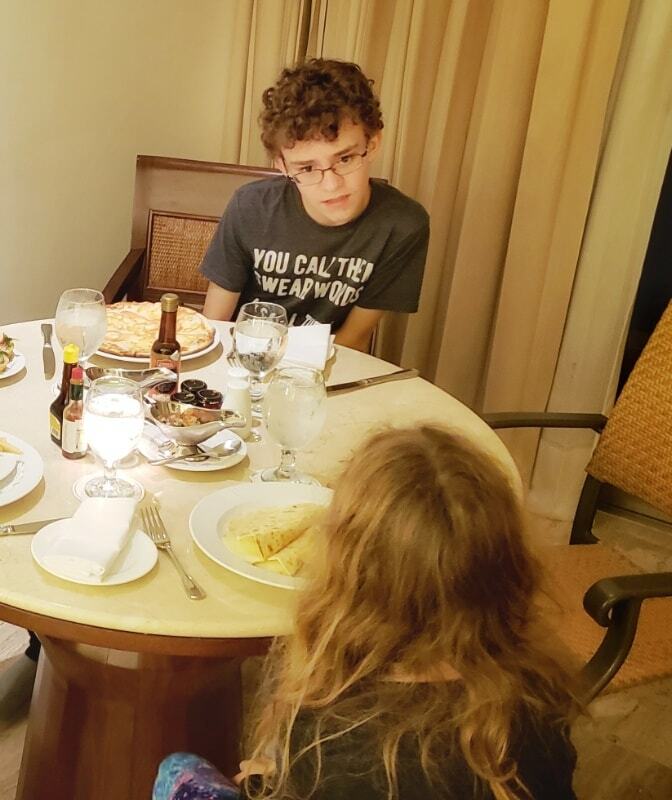 Exhausted from our late flight into Cancun, and really not wanting to deal with a restaurant with two tired and hungry kids, it was a nice perk for a travel fatigued family. I was pretty happy to see that the room service prices were almost identical to the restaurant prices downstairs, plus a small service fee. There was a large menu and we even ordered in English with no trouble. To top it off, the food was really good (we tried a vegetarian pizza, cheese quesadilla, and a sandwich with fries), and it all came with a free mini dessert, and plenty of condiments, cutlery and real silverware and cloth napkins. Lovely! 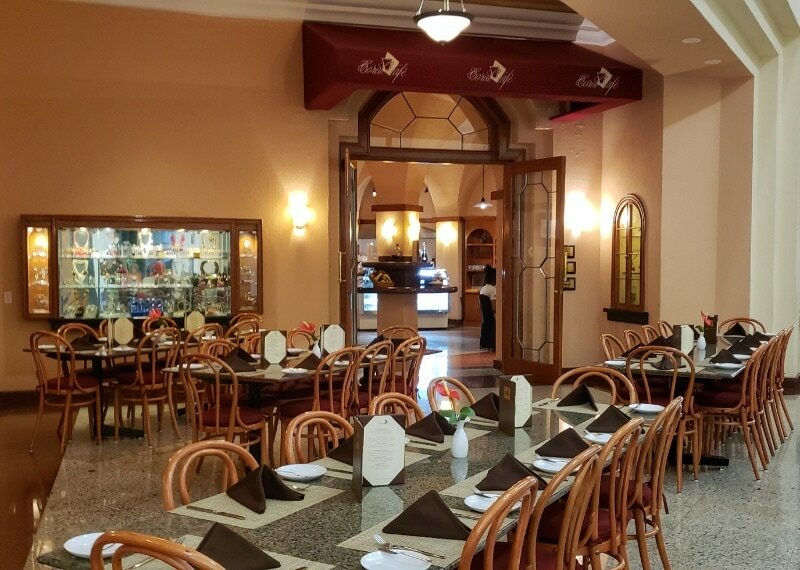 The hotel has several in house restaurants, including an upper end Five Diamond Le Basilic restaurant, the fresh seafood restaurant Isla Contoy, and the cafe style La Joya. There’s also a poolside snack bar, with some very tasty choices, and a lovely hotel lobby bar with snacks. 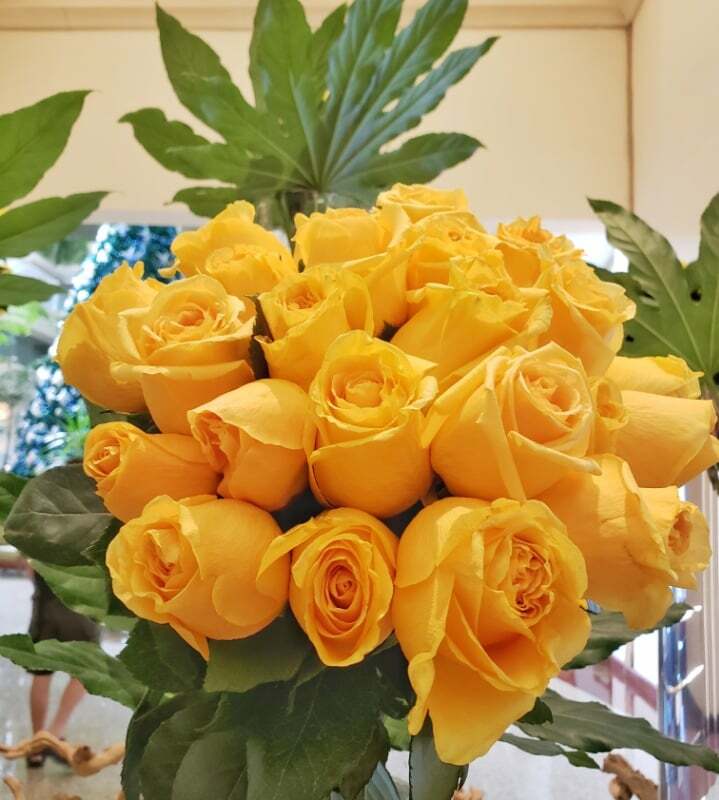 The main floor of the hotel is given over to the restaurants, as well as a wide walkway filled with beautiful flowers, and plenty of art. 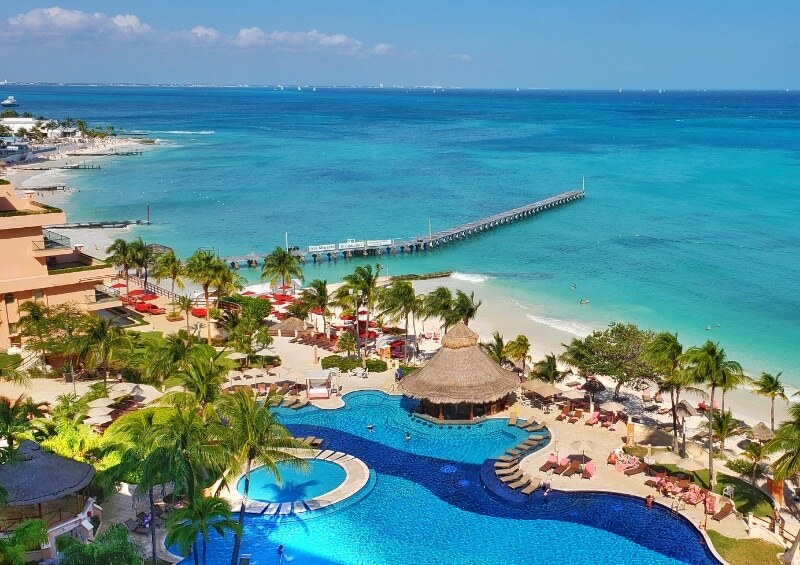 There’s a lot to see and do at the Grand Fiesta Americana Coral Beach resort hotel in Cancun. 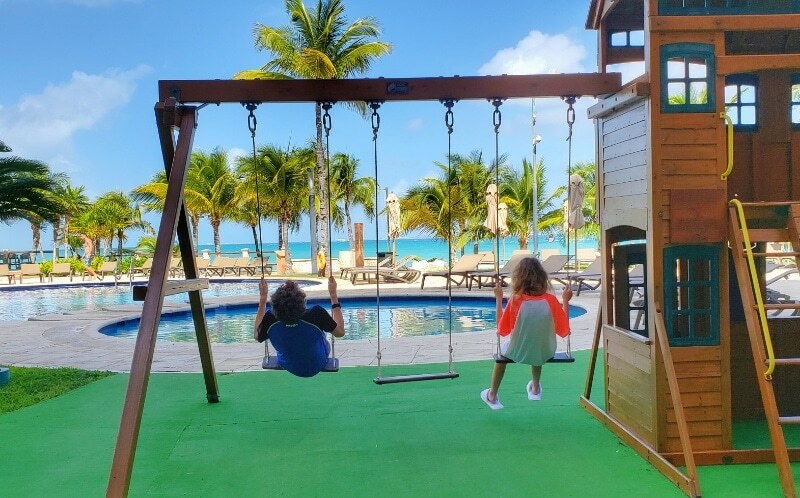 Our kids enjoyed themselves on the ocean view swings on the outside playground and the small children’s wading pool in front of it would be a great place for families with small children to hang out. There’s also a daily teens & adults activities program, with lots of fun things to do if you want to try out a few new things. 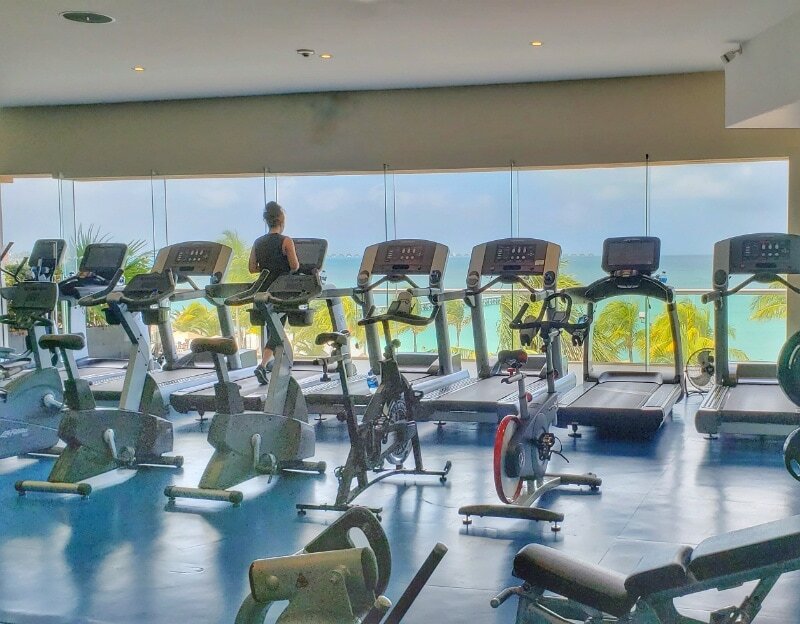 Amenities at Grand Fiesta Americana Coral Beach include beach loungers, a large health club and fitness center, yoga classes, free internet in your room, local phone calls, in room coffee and bottled water, concierge service and more. Like a lot of major hotels in Cancun, the hotel also caters to weddings and celebrations. We watched for hours from the comfort of our loungers as they set up a huge dancing and party area off to the side of the complex in preparations for a wedding later that afternoon. It looked awesome and the people seemed really happy! 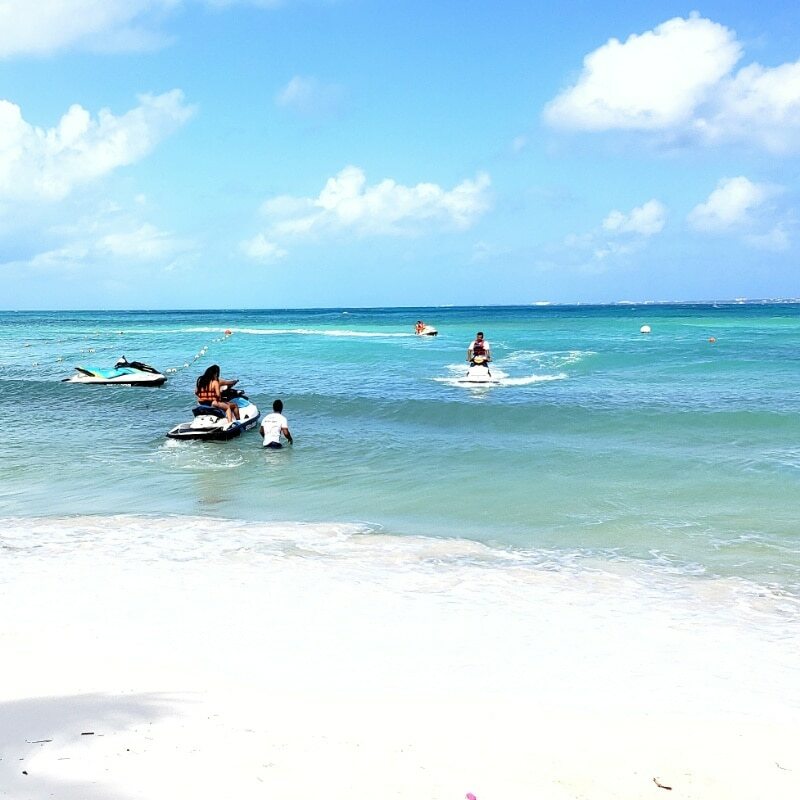 On the east side of the resort, there’s a beach side palapa that offers free kayaks plus free stand up paddle boards to the guests at Coral Beach, as well as Sea-Doos for a fee. We found it’s usually best to go in the early mornings if you want to take the kayaks or paddle boards out since the water gets rougher in the afternoon. Right next to the water activities desk is a PADI certified dive shack with free pool lessons and paid daily dives to the local reefs including around nearby Isla Mujeres as well as trips out to the underwater museum. We didn’t grab a Sea-Doo ourselves, but they sure looked like a blast! When we stayed at the beginning of high season, the rate was around $310 USD for a room only rate with two queen beds and ocean view. 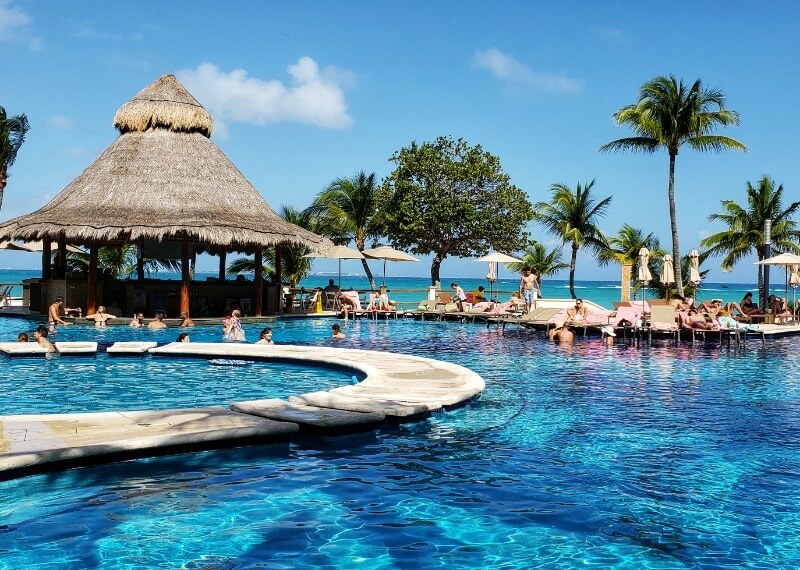 There are a few different plans available at the Grand Fiesta Americana Coral Beach. We had the room only option. There’s also a Grand Club access, where you’ll get a room on one of the resort’s highest two floors, Grand Club access to all amenities, a dedicated lounge and personal concierge, a VIP Penthouse lounge, beach side sundeck, and more luxury amenities. Like most resorts in Cancun, there’s a resort fee here of $25 USD per accommodation, per night. 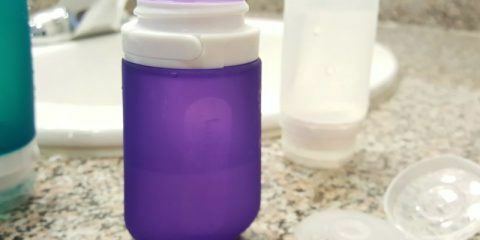 There’s also a small sanitation tax of 1.8 US dollars per night. 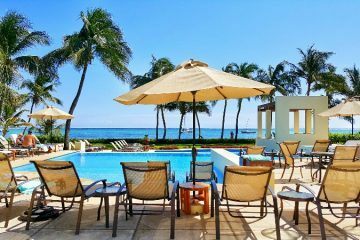 See prices and more on the Grand Fiesta Americana Coral Beach website. There’s really not much to dislike here. Since we were at the hotel mostly for the beach and pools, and the hotel has some of the best in the Cancun Hotel Zone, we were pretty happy. Like most of the hotels in the area we wish the pools were a little warmer but they were fine for December which is typically one of the coolest months in Cancun anyway. We didn’t try out all the restaurants on site so can’t comment too much on their quality however we did enjoy their room service, and both the snacks around the pool and the desserts at the La Joya cafe. This is a small thing, but I would have loved if the beach and poolside canopy beds were free to all guests. There was a fee of around $50 USD, if I remember correctly, for a private canopy lounge bed which I thought was a little high for what the services you get with it. Beach and poolside lounger chairs are free and plentiful, though, which was a great perk all in all. A really complete review. 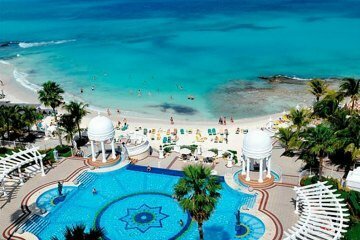 Nice Hotel, the price looks correct for the structure and service, although there is a lot of good alternatives in Cancun. I love reading your blog, I follow closely all the tips. Thanks for sharing and really very useful it is. I wrote home this hotel review for my next trip. 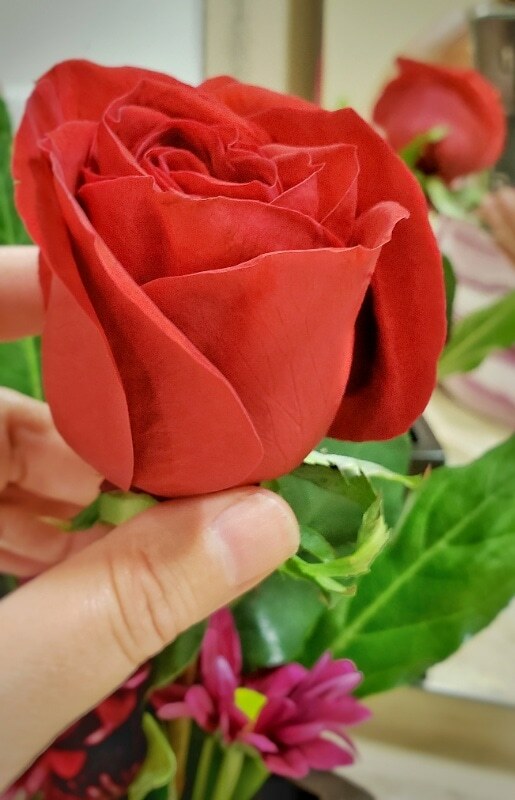 Really nice blog and beautiful pictures. Would love to visit that place once. Loved the read. Thanks for sharing. Nice to read your writing. 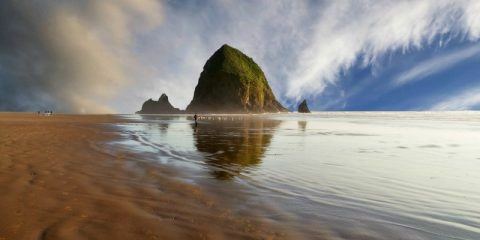 Especially your sea beach picture all are very mindblowing. I would love to visit there once in my life.